Are you in trouble in such a thing? Even in the case that a slight equipment stops has a big influence on communication equipment and production equipment. When power failure occurs, power is supplied from the storage battery without stopping for a moment. In addition, we respond to the instantaneous voltage drop that occurs during operation. Want to stabilize unstable electric power, also to cope with lowering of voltage. Even with unstable power such as electricity generated by a photovoltaic power generation system which is not suitable for precision equipment, it is possible to supply electric power steadily by using instantaneous switching UPS together. 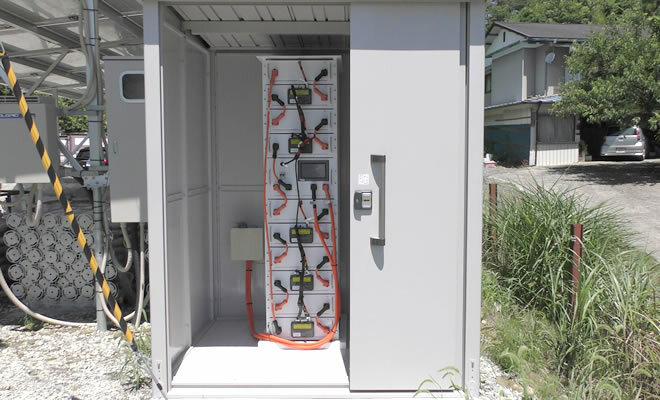 Our battery storage system can choose to charge directly from either AC / DC power supply. Besides photovoltaic power generation, direct charging is possible even when generating by wind power and it is not necessary to perform AC / DC conversion, so it is possible to prevent loss during conversion. Also, by accumulating surplus electric power after electricity generation, it can not be used unnecessarily when needed. General private power generation equipment takes time to start generating electricity, and depending on the equipment, it may be necessary to start it manually.Since large capacity, automatic switching typeof high-output UPS can be started automatically, even unattended such as night time or holiday can be used with confidence. EMS contributes to optimum operation of electric power. Peak shift function charges at night when electricity is cheap by timer setting, electricity supply during the day when we use a lot of electricity. Optimum operation according to changing electricity rate throughout the day, we will save electricity automatically. ""We highly recommend using a compatible solar power generation system together. Packaged type products are also available. You can choose according to the application and installation location. All necessary equipment such as storage batteries and power controllers are built in the storeroom and there is no need to build a new building. In addition, the wiring installed inside the storeroom in a completed state can minimized the time for introduction. For your suggestions large capacity container type is also available.